We automatically generate signup and unsubscribe forms for each audience in Mailchimp. You should always include an unsubscribe link in your email campaigns, but you could also add an unsubscribe link somewhere on your website. In this article, you'll learn how to find the unsubscribe form URL for your audience. To find the unsubscribe link for your audience, follow these steps. 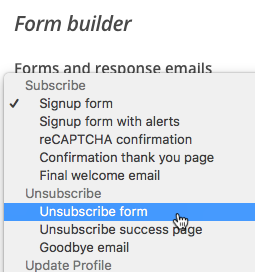 Click the Forms and response emails drop-down menu and choose Unsubscribe form. Highlight the URL in the Unsubscribe form URL field, and use you preferred method to copy it to your clipboard. Add the link somewhere on your website, behind a text link labeled "Unsubscribe," or similar. If a subscriber clicks the Unsubscribe link on your site, they'll input their email address in a form and click Unsubscribe to opt out. The subscriber will receive the Unsubscribe confirmation email if you've set that up in the Form Builder. When a subscriber declines to receive further campaigns, it's called an unsubscribe. Learn how unsubscribes work in Mailchimp and how you can manage them.